Potter's Malt Extract Paste is a traditional and nutritious malt extract of the finest quality. 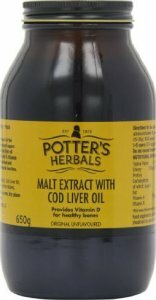 Potter's Malt Extract Paste can be spread on bread and toast, added to cereals, used as a replacement for refined sugar in most recipes, or taken by the spoonful as part of a balanced diet and healthy lifestyle. Do not use if seal is broken. Store in a cool, dry place out of the reach and sight of children.